The 2019 event will take place on Saturday night, July 13th. 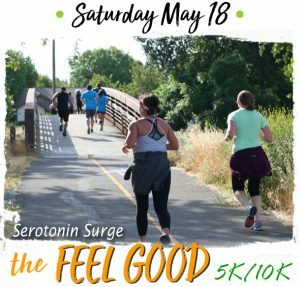 The event will include 5K, 10K and Half Marathon courses that travel through South and East Davis. For kids 12 and under, we offer a half mile fun run, which is free if you register before race day. This is a fun and festive evening event with an energetic atmosphere and great running/walking routes. Packet Pick up will begin at 5:30pm on race day at the race site. There will be no pre-race packet pick up. All 5K, 10K and Half Marathon entries include a gender specific, short sleeve technical t-shirt. Kids Fun Run entries include a short sleeve cotton t-shirt. A finisher medal is included for Half Marathon finishers. For the 5K, 10K and Kids Run, the medal is optional and can be included in your entry for $5.00 while supplies last. Shirt sizes and availability are not guaranteed for those registering at Packet Pick Up or on Race Day and will be available while supplies last. Packet Pick Up for the 2018 Moonlight Run will be on event day only, Saturday July 7th. Registration will open at 5:30pm. All events have a time limit of 3 hours for course support. This allows for a pace of up to 13:45/mile in the half marathon. The finish line will be open up to 3 hours and 15 minutes to record finishers who reach the finish line past the cut off. Please note: There is a processing fee for all entries. This fee covers the costs associated with using credit / debit cards as well as online processing and entry management and we strive to use online providers that keep the fees as low as possible. The minimum age to participate in the Half Marathon is 14 years old on race day. This may be waived on a case by case basis by e-mailing us here. There is no minimum age for the 5K or 10K as we will leave that to the parents’ discretion. All entries are non-refundable and are not transferable to another event. No cash refunds under any circumstances. No refunds of the “difference” if you drop down a division, for example from Half Marathon to 5K/10K. The “difference” may not be applied to add-ons (such as the optional medal or extra t-shirts), other runners’ entries to this event or to other events we host. If you wish to transfer your entry to a friend or family member in the case that you become injured or cannot otherwise attend, you may do so on or before 5:00 PM on July 3, 2018 using the participant self-management option. If you are unable to process the transfer on your runsignup account, please e-mail us (see below) no later than July 3. No exceptions after these deadlines. There is no fee to directly transfer to a friend/family member but your request must be handled online by the deadline. If an athlete is transferring 5K entry to a runner who wishes to participate in a more expensive event (such as the half marathon), the new entrant will need to pay the current price difference. No phone, fax or in person requests for entry transfers. All race communication is done via e-mail so please include an email that you check on your entry. Emails are not sold or traded. Questions? please e-mail us here. Headlamps and reflective gear are strongly recommended for Half Marathon participants who anticipate a finish time greater than 1 hour and 35 minutes. It will be dark by 1:45 into the race. We discourage, but do not disallow, the use of headphones/music on the route. Please be smart and keep the volume low, or use one earbud only, during the race. This allows you to hear oncoming athletes, lead bikes warnings (who may be approaching from behind), cyclists, emergency vehicles, direction from volunteers or Police and other noises around you that help keep you safe and traveling along the correct race course. Upon registering for the event, you will automatically be e-mailed a confirmation e-mail indication that the registration was successful. We suggest checking junk or “update” folders (gmail) if you do not appear to receive it within fifteen minutes. Any subsequent communication will be done by email, therefore we suggest registering with an email address that you check frequently. 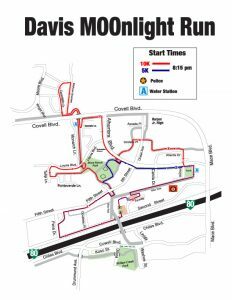 Occasional updates will be posted on our Davis Moonlight Run Facebook page. Please consider this website your primary source of race information. If you have a question regarding your race entry, please e-mail us here. Event Location: DMG Mori, 3805 Faraday Drive. Parking is available in the business parks to the west of the start/finish area on the other side of the bike overcrossing. Before and after the participants take to the course, the Davis Moo-nlight Run includes a vendor expo. This is an opportunity to showcase your products and services to a health-oriented, active demographic and a perfect chance for one-on-one interaction with potential customers, to perform sampling or demonstrations of your product and spread the message behind your company or organization’s products/services. Vendor booths are $100.00, which includes one eight foot tables and two chairs. Tents are strongly encouraged for protection from the sun. Electricity is not included, however, if you require electricity for your booth, please contact us in advance and we will do our best to accommodate your needs if we are able. Set up is at 5:00 – 5:45 p.m.; all vehicles must be out of the expo area prior to 5:45 p.m. There is vendor parking available nearby. The event will conclude at approximately 10:30 p.m.
To sign up for a booth, please click here. A processing fee will be added to all entry fees listed below. A processing fee will be applies to all entry fees listed above. All 5K, 10K, Ten Mile and Half Marathon entries include a gender specific, short sleeve technical t-shirt. Kids Fun Run entries include a short sleeve cotton t-shirt. A finisher medal is included for all finishers. All events have a time limit of 3 hours for course support. This allows for a pace of up to 13:45/mile in the half marathon and 18:00/mile in the 10 Mile. The finish line will be open up to 3 hours and 30 minutes to record finishers who reach the finish line past the cut off. The minimum age to participate in the Half Marathon is 14 years old on race day. This may be waived on a case by case basis by e-mailing us here. There is no minimum age for the 5K, 10K or Ten Mile as we will leave that to the parents’ discretion. Headlamps and reflective gear are strongly recommended for all Ten Mile and Half Marathon participants who anticipate a finish time greater than 1 hour and 35 minutes. It will be dark by 1:45 into the race. All entries are non-refundable and are not transferable to another event. No cash refunds under any circumstances. No refunds of the “difference” if you drop down a division, for example from Half Marathon to 5K/10K. The “difference” may not be applied to add-ons (such as the optional medal or extra t-shirts), other runners’ entries to this event or to other events we host. If you wish to transfer your entry to a friend or family member in the case that you become injured or cannot otherwise attend, you may do so on or before 5:00 PM on July 5, 2017 using the participant self-management option. If you are unable to process the transfer on your runsignup account, please e-mail us (see below) no later than July 5. No exceptions after these deadlines. There is no fee to directly transfer to a friend/family member but your request must be handled online by the deadline. If an athlete is transferring 5K entry to a runner who wishes to participate in a more expensive event (such as the half marathon), the new entrant will need to pay the current price difference. No phone, fax or in person requests for entry transfers. All race communication is done via e-mail so please include an email that you check on your entry. Emails are not sold or traded. Optional Commemorative Participation Medal available for $5. May be purchased by any participant in any division. Pre-order your medal by 6/15/16. Only a very limited # will be available for purchase after 6/15 and at the event. The participation medal is a different medal than the half finisher’s medal. Be sure to arrive 60-90 minutes early if picking up on race night. After you reach the finish line, join us for an evening celebration, including vendor booths and refreshments, beer, and live music. Optional Participation Medals and Tour de FIT Medals can be picked up at the “MEDAL” booth in the post-race area. Professional sports event photographers from Facchino Photography will be on-site to catch still images of you while you participate in the Moo-nlight Run. Photos will be available for viewing and purchase a few days after the event. Volunteers are needed for a variety of race tasks, including packet pick up, registration, course monitors and refreshments. Groups are welcome and to sign up as a group, or if you have any questions, please e-mail Jeannine@changeofpace.com. 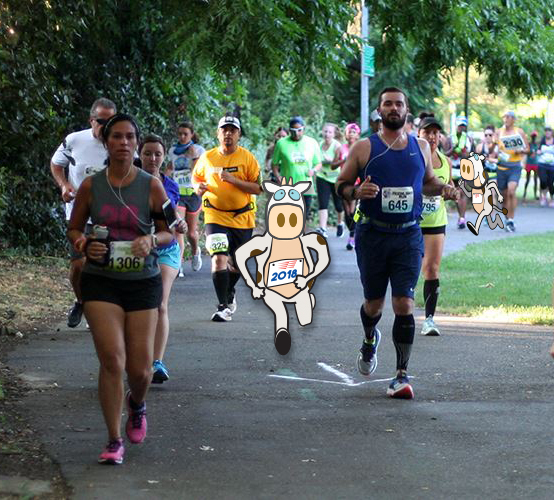 ACOP Disposable Chip Timing will be provided for the 5K, 10K, 10 Mile and Half Marathon. Timing chips will be adhered directly to your bib number and there is nothing to put on your shoe. 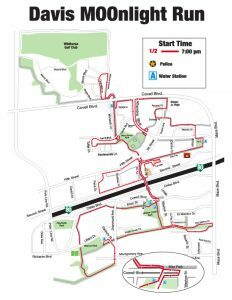 Live results & tracking will be available for those “watching” the race from home, and kiosks will be available at the event for athletes to check their times. Awards will be presented to the overall finishers in the 5K, 10K, 10 Mile and Half as well as to the top three finishers in each age division. Awards are based on chip time. Age divisions will be 5-year groups. The kid’s run will not be timed, but all finishers will receive a ribbon. All finishers in the Half Marathon & 10 Mile will receive a heavyweight medal with special glow-in-the-dark features. 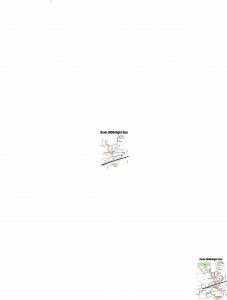 The 5K, 10K, 10 Mile and Half Marathon courses are single loop, paved courses (Download a map here). There will be one fluid station on the 5K, three on the 10K, four on the 10 Mile and six on the half marathon. There is one toilet on the 10K and five on the half marathon. All fluid stations will have both water and Gatorade. The time limit for course support for the 10K, 10 Mile and Half Marathon is 3 hours (10:00 PM). The finish line will remain open to 10:30PM. If you think you will need hydration or calories beyond what is outlined above, please carry fluids/food. 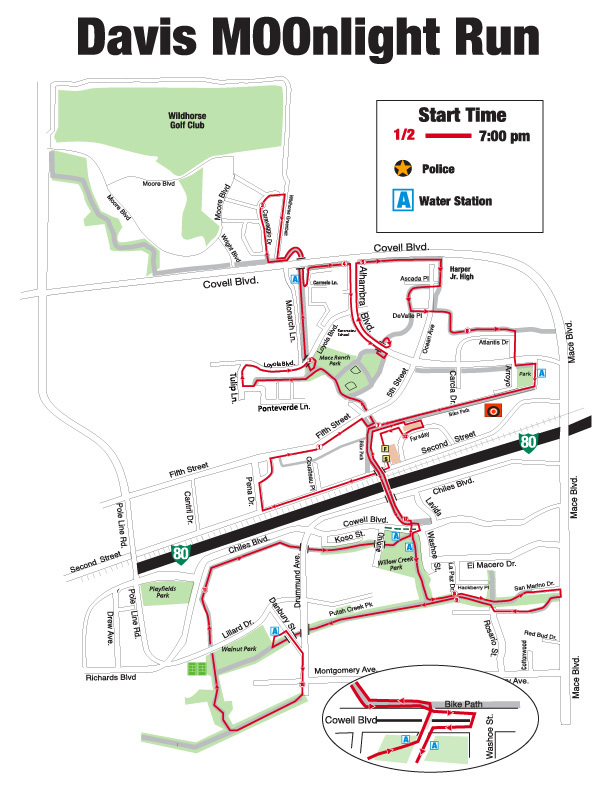 Download individual course maps (PDF) below. Q: Is there a field limit for the event? A. Yes – Field limits are 1,500 for the half marathon, 3,000 for the 5K/10K (combined), and 300 for the kids 1/2 mile. Q: Can I run with my child in the Kids Half Mile, and if so, do I need to register? A: A parent may run with a child in the kids fun run, and there is no fee to do so. Q: How do I modify my entry? A: You can “upgrade” from the 5K/10K to the Half, add on a tech shirt, and add on a finisher medal via our upgrade page here: https://acop.webconnex.com/Moon2015-upgrades If you need to drop down from the Half to the 5K/10K or switch from 5K to 10K or reverse, you may request that change by sending us an e-mail at info@changeofpace.com. Q: I am registered but will be unable to attend because I have a wedding / am going out of town / got injured / have to work / thought this was the Illinois Moonlight Run. Can I get a refund? A: We do not offer refunds under any circumstances as is stated in our refund policy that you agreed to when you registered. We will, however, unlike most events, allow you to transfer your entry, at no cost to you, to a friend/family member if the request is made on or before 5:00 PM on Tuesday, JULY 7. You may do so by e-mailing us the request along with the information for the recipient athlete (please include email address and DOB) to info@changeofpace.com. Q: I was unable to attend. Can I still get my tshirt and half marathon finisher medal? A: Please e-mail us to make arrangements to receive your t-shirt (Note: shirts not held for no shows, and we cannot guarantee size). Finisher medals for the half marathon / 10 Mile are awarded to finishers only. Q: Is the half marathon part of the California Half Marathon Series for 2015? A: It is not, however, it is Stage 5 (the conclusion of Part One) of the NorCal Tour de FIT Series. Q: Do you permit Baby Joggers and Strollers? A: We do, but we ask that you start in the back of the pack for you and your child’s safety and the safety of those around you. We do not suggest the use of baby joggers in the half marathon but do leave that at the discretion of the parent. Q: Does this event have Chip Timing? A: Yes, the 5K, 10K and Half Marathon will be timed using our disposable RFID Chip timing. The timing chips will be affixed directly to the back of your race bib – there is nothing to put on your shoe. Q: Do you have finishers medals? A: Finishers in the Half Marathon and Ten Mile will receive a finisher’s medal. Finisher’s in the Kid’s 1/2 Mile run will receive a ribbon. You can order an optional “Participation Medal” for $5.00. This is a great option for those in the 5K, 10K or Kids race who would like a medal. Q: What is the Half Marathon course like in terms of elevation? A: The course is mostly flat (it’s Davis, after all!) although there are a few inclines/declines as you cross the footbridges over I-80. Q: Are there training groups for this event? A: Yes, Fleet Feet-Davis will have a training group. Visit http://www.fleetfeetdavis.com/summer-half-marathon-training. Q: Do you accept race night registration? A: Yes, we do, provided there is still space available. We accept credit/debit, cash and check as forms of payment when registering on race day. Q: Why is there a “Transaction fee” to register online? A: This fee exists to cover the credit card processing fees that we are charged to process the transaction. We aim to find online providers and banks with the lowest fees in order to keep that cost as low as possible. Q: Can I run with my dog or other four-legged friend? A: We love dogs and know many runners and walkers out there enjoy exercising with them by their side. However, we must limit canine participation in all our events to those which are seeing eye dogs for those who are sight-impaired. Otherwise, dogs (and any other pets) pose a risk on the race course to others, which can range from dog bites, disagreements from one dog to another, leash tripping hazards, stepping in dog poop and the like. Dogs can also suffer from dehydration when running a distance or pace of which they are not accustomed, and we will not have sufficient dog-friendly hydration options (dog bowls) on the race course. Finally, dogs are not permitted under our race insurance. We kindly ask that you leave your pets at home during the event. Q: Can I run with an ipod? A: We strongly discourage running/walking with an ipod/music device because it impairs your ability to use one of your most important senses when running: your hearing. You are less likely to hear key sounds around you such as: direction of course marshalls/police; oncoming vehicles; emergency vehicles; bicycles; other athletes on the course. Your hearing becomes even more crucial when running in the dark. If you decide to run with an ipod, we suggest putting a bud in only one ear and keeping the volume at a low enough level that you can remain aware of your surroundings. Q: Do you have pacers for the half marathon? A: Yes, we have experienced pace group teams for goal finish times from 1:30 to 2:30 in five minute increments. There is no sign up; simply find them at the start line or anywhere on the course and join in. Pace Group leaders will be wearing the yellow GVH singlet and carrying the pace sign. Q: Am I allowed to start late? Say, at 8:30 PM? A: No. This would create safety issues. Q: Am I allowed to start early? Say, at 5:30 PM? A: Unfortunately no, our permits do not allow for early starts. Q: What will each fluid station offer on the course? A: All fluid stations will have water and Gatorade. Q: Do you have a tracking app? A: We have tracking for all divisions, but there is no app to buy and/or download. 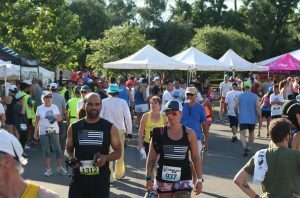 You can use our website results page (http://changeofpace.com/davis-moonlight-race/results/) to track athletes and/or review results. The link will be up approximately 2 weeks before the race. Q: I ordered a participation medal. Where do I pick that up? Packet Pick Up? The finish line? A: Optional participation medals may be picked up after you run/walk your race in the post-race area at the “Medal Pick Up” booth. Your name will be on a list and there will also be an indication on the label on your bib number. Q: What is the cut off time for the Half Marathon? Is it walker friendly? A: The course amenities (water stations, volunteers, etc) will remain in effect for those on pace for a finish time of 3 hours from the first wave start. Athletes on the course with a predicted finish time after 3:00 will be asked to follow the rules of the road. The finish line (timing) will remain open until 3 hours and 30 minutes. 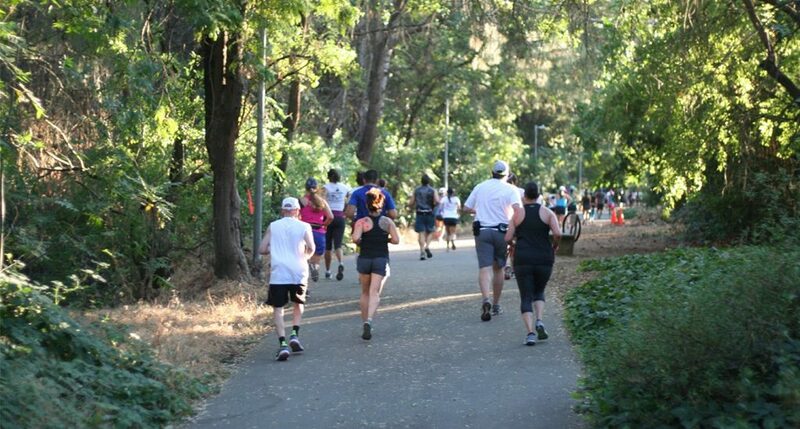 We encourage walkers, runners, joggers and everything in-between. However, due to the evening nature of this race and with consideration to our permits and volunteers on the course, we have established these timelines. This year we have added a ten mile race with a three hour cut off for runners and walkers whose pace may not meet the 3 hour cut off for the half marathon. Q: Where should we park? 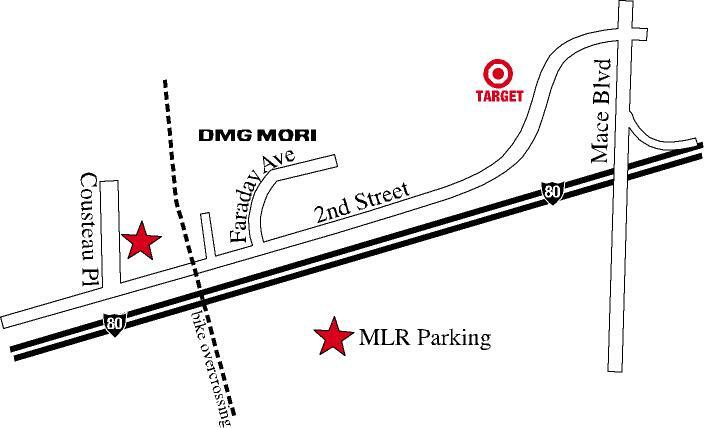 A: Parking is available at the DMG Mori campus as well as at the adjacent business parks along Second Street. See below map. Do you have a question not answered here? Please feel free to e-mail us. 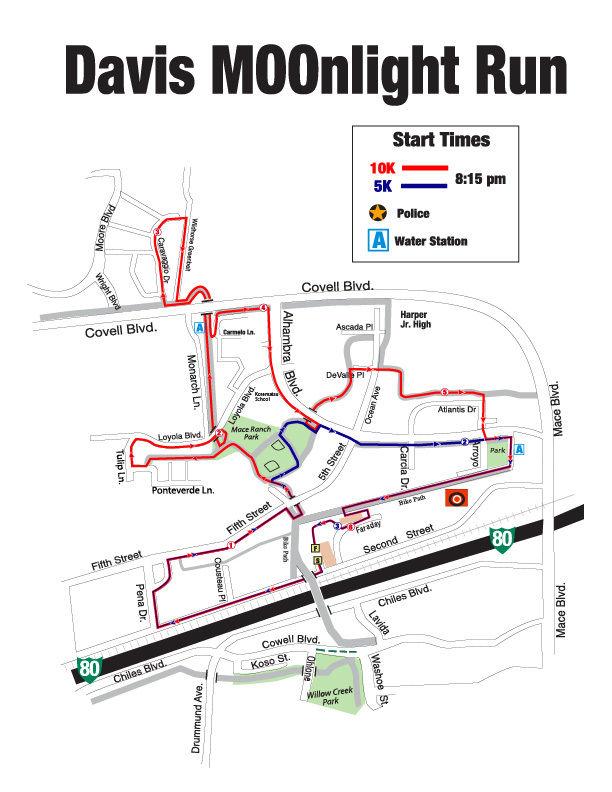 Vendor booth space is available at the Davis Moo-nlight Races. Each booth includes one 10×10′ space, one 8 foot table and two chairs. Not included: tablecloths, electricity, tent, signage. Expo takes place on pavement. Fees: Vary by booth type; contact us for more info. Now that you are successfully registered for summer’s most popular event, you can sit back and just focus on your training. Below we have listed a few resources as well as tips for you as you prepare for the event. Race night is similar, yet also very different than race morning. We suggest you schedule in a few pre-race training runs to emulate race day so that you can get a sense of how your body will be best prepared for race night. Meals. It is often suggested that you don’t eat any large meals after lunch. Experiment with what your body likes best in terms of protein/fat/carb ratios. You don’t want to go into the race starving, but a full stomach won’t be comfortable either. Hydration. How can you achieve that fine line so that you are hydrated, yet you don’t have to stop for a nature break every two miles? Practice. Night running (half marathoners). Practice running with a headlamp. We strongly suggest headlamps or other illuminating accessories for anyone planning on finishing in 1:45 or greater. Since it will start out sunny, you may want to experiment with sunglasses, caps, etc. The weather. (Forecast is awesome. See image to right) It likely won’t be any cooler than 85* F at race start, but it could range anywhere from 85* to 105*. The last two years we have been especially lucky, with race night being unseasonably cool for this region in mid-July. However, for those in the Bay Area, it still feels hot. Acclimate to running/walking in warm or hot temps if you are able. Traveling to the race. When you travel to the race, you may hit traffic or just general Saturday congestion. Don’t plan as if this were a morning race, when the roads are relatively empty at 4:30 AM. 4:00 PM will be a whole ‘nother story. Allow DOUBLE the time you would if you were traveling for a morning race. Yes, I said double. Verify that you are registered using the lookup here. Use the search box and type in your first or last name. Need to change divisions? Yes, we need to know so that you can be issued the correct bib number. E-mail us with any changes at info@changeofpace.com or make the adjustment within your runsignup account. Race Day Arrival Time. Arrive at least one hour, to 1.5 hours, prior to your division start time. Second street will close early due to the kids fun run. Allow extra time to travel to the race (traffic). I-80 tends to be congested on Saturday afternoons and there will be many, many more cars on the road in the afternoon, than you would see during travel to a morning race. Parking. There are two primary parking areas. The most optimal parking area is located to the west of the DMG Mori facility on the west side of the pedestrian footbridge. Award Winners. Awards are presented to the top three finishers in each age group. Awards may be picked up race night. Please note: unclaimed awards are not mailed. You may pick up participation medals, and NorCal Tour de FIT medals at their respective tents in the Post-Race festival. Please pick up these items AFTER you finish the race. The NorCal Tour de FIT tent will open at 8:00 PM. The image is intended to be a visual to aid you in knowing in advance where these tents will be located.